Some inmates are behind bars because they cannot afford advocates-, do not know how to represent themselves and are intimidated by the Courts. On the 27th of July – 5th of August , 2015 Kituo cha Sheria, in partnership with ICJ-K, Kenya National Commission on Human Rights Haki Mashinani and LRF empowered prisoners and prison warders at the Kisumu Main Prison(K’odiaga) on the criminal trial process and self-representation so that they can in turn offer legal aid services to the wider K’odiaga prison community. Access to justice is a right guaranteed for all in the Constitution. A fact finding mission conducted by Kituo advocates revealed that K’odiaga had more remandees than any other prison. The findings were that the prisoners and remandees greatly require legal empowerment on how to conduct self-representation in court, how to adduce evidence if any, how to cross examine witnesses, how to write their submissions, how to make mitigation statements, how to make interim applications such as those for bond, bail, certificates, how to request for documents and how to lodge a complaint against judicial officers. On the part of the prison officers, they requested that they be educated or to have their capacity built especially with regards to the Constitution, laws governing prisons and the general administration of justice, to be trained on how to draft pleadings to enable them assist the in-mates, those on remand or in custody. The K’odiaga training was historic because it was part of build up activities held towards Prisoners’ Justice Day that was commemorated for the first time in Kenya on 10th August 2015. THE PLACE OF DISABILITY RIGHTS FOR REFUGEES IN KENYA: DOUBLE VULNERABILITY? A quick search on the internet reveals that there are no statistics of refugees with disabilities. They are a category of persons who are mostly forgotten. Some of them become disabled because of reasons that they have fled their countries of origin like war. The search further reveals that about 15 percent of the world population has a disability. Disability rights are provided for in the Convention of Rights of Persons with Disability (CRPD) and the Constitution of Kenya. All refugee legislation has no provisions for persons with disabilities. It is important to note that Article 27 of the Kenyan constitution prohibits discrimination on the basis of disability. The principle of non discrimination is one of the underlying principles in the CRPD. It is recognized that persons are bound to face discrimination on various grounds which is a case that refugees with disabilities face. Refugees are protected by the CRPD. The UNHCR refugee agency in Kenya has implemented the principles of the CRPD in her operation. However, unfortunately the implementation of the rights of persons with disability among refugees is not yet fully attained. For example, refugee camps have seen some benefiting from equipment to assist with their disability but the situation remains far from ideal. Persons with disabilities are defined as those who have long-term physical, mental, intellectual or sensory impairments which in interaction with various barriers may hinder their full and effective participation in society on an equal basis with others. An example of a barrier is where a person on a wheel chair cannot be able to access a building with only stairs but no lifts or a ramp. The rights of persons with disabilities are covered in Sections 10-30 of the CRPD. These rights cut across rights such as equal access to justice, liberty and security of person, freedom from torture or cruel, inhuman or degrading treatment or punishment, freedom from exploitation, violence and abuse, liberty of movement and nationality. Living independently and being included in the community and the socio economic rights provided for in our constitution under Article 47 also hold. It is important to note that the convention provides for progressive realization of these rights for persons with disability. It places an obligation on states to progressively realize socio economic and cultural rights of refugees with disabilities. Perhaps it’s time that their rights were realized by both state and non state actors; to start with, how about getting proper statistics of refugees with disability. Finally, Article 1 of the Universal Declaration on Human Rights (UDHR) states that all human beings are born free and equal in rights. They are endowed with reason and conscience and should act towards one another in a spirit of brotherhood. 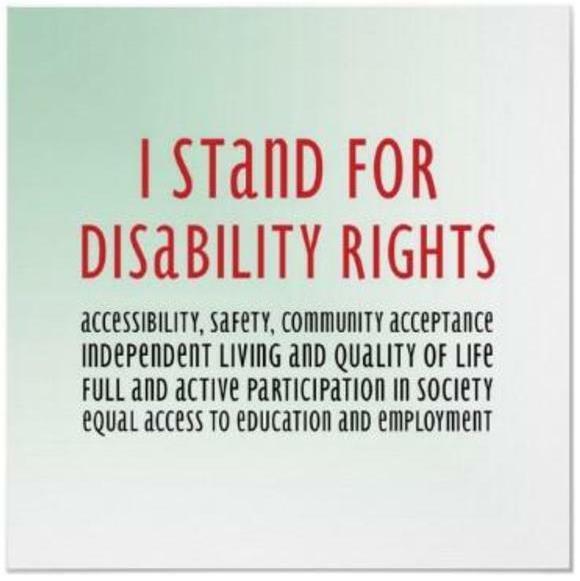 Therefore whether a person is with disability or not they should be treated equally. Posted on August 6, 2015 October 9, 2015 Categories Advocacy Statements, ArticlesLeave a comment on THE PLACE OF DISABILITY RIGHTS FOR REFUGEES IN KENYA: DOUBLE VULNERABILITY?